If you’re a pastor, you know the value of good solid resources. Below you’ll find my list of pastor and preaching resources. This is a live list, and will be updated as I find more and add them here. This list consists of what I believe are books and materials to help you as you prepare sermons and grow your ministry. These resources contain links to Amazon. If you buy a resource on Amazon through this list, I will receive a small commission. This does not affect the price you pay. Thank you for buying through Busy Pastor Sermons and supporting this ministry. The primary resource and anchor for a pastor is the Bible. There is no other tool more important. I enjoy a good study Bible. It’s like having a mini-commentary on the same page as the Bible. I also like to read from different Bible versions to get a good, solid understanding of the text. My eyesight is not as sharp as it once was, so I prefer large print. The ESV Study Bible, Large Print edition features the content of the award-winning ESV Study Bible with a highly readable, large-print type. Extensive study notes, charts, maps, and articles make this study Bible a valuable resource for serious readers, students, and teachers of God’s Word. The KJV Study Bible Large Print Edition is identical to the KJV Study Bible published in 2012. Both editions are modeled after Holman’s own 2011 ECPA Christian Book Award-winning HCSB Study Bible, where every well-conceived study help is practically placed on the same page spread as the related biblical text. This Bible also features 15,000 study notes, 141 photos, 62 timelines, 59 maps, 40-page concordance, 20 articles and essays, 16 illustrations and reconstructions, 15 charts, and a helpful glossary of 17th century expressions relative to the KJV’s signature phrasing. Other details of the KJV Study Bible Large Print Edition include a two-column text setting, center-column cross references, the words of Christ in red, one and three-year Bible reading plans, a notes section, four-color presentation page, and two-piece die-cut gift box. As Baby Boomers grow older, they are looking for large print editions of both books and Bibles. In addition, after spending all day in front of a computer, younger adults are gravitating to larger print editions. Today's #1-selling study Bible―The Life Application Study Bible―is now available in multiple large-print bindings. The Life Application Study Bible is updated and expanded with over 300 new Life Application notes, nearly 350 note revisions, 16 new personality profiles, updated charts, and a Christian Worker's Resource. Trim Size:6.5 x 9.188 in. From the moment you pick it up, you’ll know it’s a classic. The MacArthur Study Bible is perfect for serious study. Dr. John MacArthur has collected his pastoral and scholarly work of more than 35 years to create the most comprehensive study Bible available. No other study Bible does such a thorough job of explaining the historical context, unfolding the meaning of the text, and making it practical for your life. After the Bible, I find basic Bible study tools are tremendous resources. A good concordance, Bible dictionary, Bible handbook, and a word study book go a long way in preparing a rock-solid message. Only this concordance provides a complete index of every appearance of every word in the NIV Bible; it’s a must-own for every serious reader of the Scripture. More accurate and comprehensive than online searches and Strong's concordances, and offering complete access to the Hebrew, Aramaic, and Greek words from which the Bible was translated, this award-winning resource promises to make your Bible study the very best. Features include the following: (1) Complete alphabetical listing of every word in the Bible, with book/chapter/verse Bible references, context line, and the G/K number for the word translated by the NIV; (2) Dictionary-indexes that define every Hebrew, Aramaic, and Greek word in the Bible, including the possible meaning of every proper name; (3) Frequency counts given for each biblical word, both in the original languages and in English; (4) Special index of articles, conjunctions, particles, prepositions, and pronouns; (5) Unique numbering system developed by Goodrick and Kohlenberger (G/K) that eliminates the inherent gaps, flaws, and inaccuracies of the old Strong's numbering system and refers the user to the Hebrew, Aramaic, and Greek words that are translated by the NIV. With more than 340,000 references connected to every verse in the Bible, the ESV Exhaustive Concordance makes an excellent study companion for the English Standard Version of the Bible. The ESV Bible combines word-for-word accuracy with readability, literary excellence, and depth of meaning, and this concordance is an ideal reference tool for quickly locating particular passages or for conducting in-depth word studies. For 25 years the Holman Illustrated Bible Dictionary has been the go-to Bible reference resource for lay Bible students, teachers, pastors, academic courses, and libraries. Those who have used it have praised its comprehensiveness, conciseness, and clarity. Over 6,500 articles from Aaron to Zuzite are written to equip the reader for greater competence in understanding and interpreting the Scriptures. Each article is structured to begin with a concise definition followed by a thorough development of the topic. Some 700 full-color photos, maps, reconstructions, and charts enrich the experience of those who use the Dictionary for personal study, academic work, and preparation for teaching and preaching the Bible. The Zondervan Illustrated Bible Dictionary provides a visually stimulating journey for anyone interested in learning more about the world of the Bible. Through the articles, sidebars, charts, maps, and full-color images included in this volume, the text of the Old and New Testaments will come alive for you as never before. As a condensation of the Zondervan Pictorial Encyclopedia of the Bible, the information contained within this reference work is solid and biblically sound. The material is based completely on the NIV and cross-referenced to the King James Version, and it contains over 7,200 entries, 500 full-color photographs, charts, and illustrations, 75 full-color maps, and a Scripture index … making this wonderful Bible study resource a must-have whether you’re a general reader of the Bible, a pastor, or a student. More than 80 years after its initial publication, Halley’s Bible Handbook remains a bestseller in its various editions, with millions of copies sold worldwide. Now available in this large print edition, this world-renowned Bible handbook has been consistently updated and revised to accurately provide even greater clarity, insight, and usefulness. One of the keys to enjoying an in-depth and rewarding experience of reading the Bible is recapturing the ancient world--its cultures, customs, and histories. With this innovative guide, readers can enrich their study with fascinating insights into the Bible and the world in which it was written. The Baker Illustrated Bible Handbook offers the most up-to-date evangelical biblical scholarship in a format that is readable and easy to understand. This book-by-book guide brings the Bible to life with more than 1,100 full-color pages packed with illustrations, maps, and photos, and 112 in-depth articles on a wide range of topics important to students of the Bible. Readers will discover how each part of the Bible fits into and informs every other part, giving them a cohesive understanding of God's Word. No reference collection will be complete without this incredible new handbook to the Bible. This practical tool brings an understanding of the ancient world together with the timeless message of God's Word to expand Biblical insights for the modern readers. Features include: articles, outlines and commentary from leading evangelical scholars, full-color photos, illustrations, charts and maps, special section on historical background and recent findings in Biblical archaeology, highlighted, theological teaching and ethical message of each Bible book, and study questions for further reflection. Everyone who studies the Bible wishes at some point that he or she knew the original Hebrew or Greek in order to better understand a difficult word or passage. The"Expository Dictionary of Bible Words" gives readers the fruits of a working knowledge Hebrew and Greek without the years of language study. The "Expository Dictionary of Bible Words" is more than just a handy and thorough alphabetical guide to the English translation of the Hebrew and Greek words used in both Testaments. There are thousands of articles, all arranged alphabetically by English word and coded to "Strong s "numbering system for ease of use. Each article is divided into two sections Old Testament (Hebrew) Words and New Testament (Greek) Words with an entry for the Hebrew or Greek word along with its transliteration, translation, range of meaning(s), and comments on its use in different biblical contexts. A comprehensive system of cross-references aids the reader in finding different words as well as discussions of related words and themes. Although reference works like "Vine s" and "Englishman s "have long aided Christians in understanding the nuances of different biblical words, the "Expository Dictionary of Bible Words "surpasses all available reference works. The Additional Notes to articles throughout the volume provide valuable and insightful information on the connections between Old and New Testament words and themes." The most affordable complete edition of Vine's famous Old and New Testament dictionaries available, this super value edition of a classic study resource helps those with limited or no background in Hebrew or Greek to study the meaning of biblical words in the original languages. A great resource for students, pastors, and anyone who enjoys biblical word studies. Serves as a dictionary, commentary, and concordance. Commentaries are wonderful tools for sermon preparation. I often get new insight or find little nuances by consulting commentaries. Commentaries come in many varieties. There are one volume commentaries for quick access and easy use. They also don’t take up as much space on the bookshelf. Then there are the multi-volume commentary sets, usually containing commentary on only one or two books of the Bible per volume. In many cases, multi-volume commentaries go much deeper into the text, often with in-depth exposition of Greek or Hebrew. A good commentary or commentary set should be the goal of a pastor. It is important for Christians to grow in biblical knowledge, however, the word “commentary” can be intimidating. The second edition of Believer’s Bible Commentary,Thomas Nelson’s best-selling commentary, is specifically designed as a user-friendly tool for believers wanting to better understand the Bible but aren’t sure where to begin. The commentary, written by the late William MacDonald, explores all 66 books of the Bible and tackles controversial issues from a theologically-conservative standpoint while also presenting alternate views. Believer’s Bible Commentary is a great introduction to Bible study, giving clarity and context to scripture in easy-to-understand language and practical application. This set includes the entire collection of the MacArthur New Testament Commentary series: Matthew 1-7, Matthew 8-15, Matthew 16-23, Matthew 24-28, Mark 1-8, Mark 9-16, Luke 1-5, Luke 6-10, Luke 11-17, Luke 18-24, John 1-11, John 12-21, Acts 1-12, Acts 13-28, Romans 1-8, Romans 9-16, 1 Corinthians, 2 Corinthians, Galatians, Ephesians, Philippians, Colossians & Philemon, 1 & 2 Thessalonians, 1 Timothy, 2 Timothy, Titus, Hebrews, James, 1 Peter, 2 Peter & Jude, 1-3 John, Revelation 1-11, Revelation 12-22, and the whole-commentary Index. No other reference series gets to the heart of the Old Testament as efficiently as the Holman Old Testament Commentary (HOTC). When a reader’s time allows, the series offers a detailed interpretation based on the popular New International Version text. When time is short, it delivers an essential understanding of the Old Testament with unsurpassed clarity and convenience. Now all twenty volumes in the HOTC series are available in one generously discounted set. The twelve volume Holman New Testament Commentary series is also offered at a reduced rate. A balanced and respectful approach toward marked differences of opinion. Here’s an accessible reference that aids personal Bible study or Sunday school preparation—the Layman’s Bible Commentary, reference for the everyday Christian, not the scholar! This 12-volume set covers all 66 Bible books—from Genesis to Revelation—providing section-by-section commentary on the flow and theme of each book, as well as historical and literary context for each. Major interpretations are presented for controversial passages and topics. Puzzling passages and Bible practices are explained, and charts and diagrams further aid your understanding. And “Take It Home” segments provide a practical application for each passage. A complete reference edition of the 60-volume Thru the Bible commentary series, this five-volume set is an excellent choice if you need a complete Bible commentary in durable hardcover bindings. It includes Dr. McGee's insightful study of each book of the Bible with in-depth, paragraph-by-paragraph discussions of key verses and passages. Purchase the entire five-volume set or collect them individually as your study progresses. Prepared by some of the world's leading New Testament scholars, this series provides an exposition of the New Testament books that is thorough and fully abreast of modern scholarship yet faithful to the scriptures as the infallible Word of God. Our theology has to be firm when we stand before God’s people preaching God’s Word. In my opinion, every pastor should be a student of theology. The world, including many Christians (even pastors), have no idea what they believe or what they should believe. These theology books dive deep into the foundational doctrines of conservative Christian theology. This work of a lifetime was widely praised when it was first published in four volumes. It is organized in eight key sections: an introduction to theology, the Bible, God, creation, sin, salvation, church, and last things. Geisler's writing is accessible to students, pastors, and laypeople interested in learning, as he deals with the concepts foundational to Christianity. "For those who value careful thinking, tight logic, fair evaluation, and keen insights, this systematic theology is must-reading." --Ken Rhodes. Doctrine isn’t just for theologians―it’s important for every Christian because it shows us who God is and how we should live. Systematizing the robust theology that has undergirded John MacArthur’s well-known preaching ministry for decades, this overview of basic Christian doctrine covers topics such as God the Father, Jesus Christ, the Holy Spirit, the Bible, salvation, and more. Comprehensive in scope yet written to be accessible to the average reader―with non-technical vocabulary, minimal footnotes, and a helpful bibliography―this volume offers Christians a solid foundation for what they believe and why. Michael Horton’s highly anticipated The Christian Faith represents his magnum opus and will be viewed as one of―if not the―most important systematic theologies since Louis Berkhof wrote his in 1932. A prolific, award-winning author and theologian, Professor Horton views this volume as “doctrine that can be preached, experienced, and lived, as well as understood, clarified, and articulated.” It is written for a growing cast of pilgrims making their way together and will be especially welcomed by professors, pastors, students, and armchair theologians.Features of this volume include: (1) a brief synopsis of biblical passages that inform a particular doctrine; (2) surveys of past and current theologies with contemporary emphasis on exegetical, philosophical, practical, and theological questions; (3) substantial interaction with various Christian movements within the Protestant, Catholic, and Orthodoxy traditions, as well as the hermeneutical issues raised by postmodernity; and (4) charts, sidebars, questions for discussion, and an extensive bibliography, divided into different entry levels and topics. Leading evangelical scholar Millard Erickson offers a new edition of his bestselling doctrine text (over 100,000 copies sold), now thoroughly revised throughout. This book is an abridged, less technical version of Erickson's classic Christian Theology. Pastors and students alike will find this survey of Christian theology and doctrine to be biblical, contemporary, moderate, and fair to various positions. It is a practical and accessible resource that applies doctrine to Christian life and ministry. This book is supplemented with helpful web materials for students and professors through Baker Academic's Textbook eSources. Everyone is a theologian of sorts. Theology simply means thinking about God and expressing those thoughts in some way. But sloppy theology is a problem. As Christians, our thoughts about God need to coincide with what He has said about Himself in the Bible. With his clear understanding of the Scriptures and accessible writing style, Charles Ryrie has written Basic Theology for every student of God's Word, from the lay reader to the seminary student. Only one hermeneutical text published prior to the New International Dictionary of Old Testament Theology & Exegesis can be held up reasonably to its measure of quality and the exhaustive nature of the research that produced this immense work. That singular collection worthy of comparison is its counterpart, the New International Dictionary of New Testament Theology, edited by Colin Brown. This 5 volume addition to that acclaimed work, though intimidating in the achievement it embodies, is intended for serious Old Testament and exegetical study by men and women of all walks of life -- both academics and pastors, students and laypersons. Volume one contains a Guide to Old Testament Theology and Exegesis in which ten essays have been compiled to thoroughly explain proper hermeneutics and interpretation, as well as guidelines for using this source material. Volumes one through four contain the Lexicon of the Old Testament, all words found in the text ordered by Hebrew alphabetization for easy reference, and coupled with a Goodrick / Kohlenberger cross-referencing number to be used in conjunction with Strong's numbering system. The relationship of each word in different contexts and languages is also explained, including alternative words, and the particulars of their semantic domain. All this information is, of course, complete with bibliography. Volume four also begins the Topical Dictionary. Therein can be found articles on the theology of each Old Testament book individually, as well as discussion of biblical concepts, people, places, events, and literary pieces, all information that is cross-referenced to the preceding Hebraic Lexicon. Finally, volume five contains a series of indexes: Hebrew Index, Scripture Index, Subject Index, and an index of Semantic Fields. Taken as a whole, the New International Dictionary of Old Testament Theology & Exegesis is an unparalleled accomplishment in the field of biblical hermeneutics. This three-volume set of Integrative Theology is designed to help students in a pluralistic world utilize a standard method of fruitful research. Each chapter on a major doctrine: (1) states a classic issue of ultimate concern; (2) surveys alternative past and present answers; and (3) tests those proposals by their congruence with information on the subject progressively revealed from Genesis to Revelation. Then the chapter (4) formulates a doctrinal conclusion that consistently fits the many lines of biblical data; (5) defends that conviction respectfully; and finally (6) explores the conclusion's relevance to a person's spiritual birth, growth and service to others, all for the glory of God. 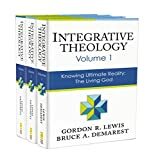 In short, Integrative Theology masterfully integrates the disciplines of historical, biblical, systematic, apologetic, and practical theology. It’s one thing to have the resources for building a sermon. It’s another to put it all together into something that conveys the message God has for His people. These books guide you through building effective sermons and help you develop a process that will serve you for your entire ministry. For over 30 years, Dr. Martyn Lloyd-Jones ministered at Westminster Chapel in London. Today, he is widely considered one of the greatest preachers of the 20th century. Based on a series of lectures originally given by Lloyd-Jones to the students of Westminster Theological Seminary in the spring of 1969, this collection of essays on the essence of powerful preaching has become a modern classic. Lloyd-Jones defends the primacy of preaching, showing that there is no substitute, and he challenges preachers to take their calling seriously: "The most urgent need in the Christian Church today is true preaching." He also provides practical direction on the task of preparing a sermon, sharing insights on the shape and form of a message as well as covering such topics as the use of humor, giving invitations in a message and the preacher’s relationship to the congregation. If you can own only one book on preaching, make this the one you read.This 40th anniversary edition includes the original text of Preaching and Preachers along with essays by Bryan Chapell, Mark Dever, Kevin DeYoung, Ligon Duncan, Timothy Keller and John Piper reflecting on the impact this book and the ministry of Lloyd-Jones had on their preaching. This is a book that will continue to speak to a new generation of preachers and teachers for years to come. A standard textbook on the art and craft of preaching. Craddock weaves history, theology, and hermeneutics into an exhaustive text on sermon preparation and preaching. Painstakingly prepared for seminary students and clergy, this book answers the fundamental question: How does one prepare and deliver a sermon? Craddock's approach is practical, but also allows for concentrated study of any particular dimension of the process. "Filled with practical wisdom. . . . A liberating book." --Richard Lischer, Duke University. In this complete guide to expository preaching, Bryan Chapell teaches the basics of preparation, organization, and delivery--the trademarks of great preaching. This new edition of a bestselling resource, now updated and revised throughout, shows how Chapell's case for expository preaching reaches twenty-first-century readers. John MacArthur and other distinguished teachers of preachers respond to the apostle's mandate in this comprehensive treatment of expository preaching. Dr. MacArthur's well-known passion for the Scriptures is combined with the vision and expertise of other faculty members at The Master's Seminary to produce a definitive statement on how to unfold the meaning of God's Word effectively to today's congregation. Other contributors include: James F. Stitzinger, James E. Rosscup, Robert L. Thomas, George J. Zemek, Donald G. McDougall, Richard L. Mayhue, Irvin A. Busenitz, and David C. Deuel. In this accessible volume―written for preachers and preachers in training―pastor David Helm outlines what must be believed and accomplished to become a faithful expositor of God’s Word. “I would not be who I am and I would not be doing what I do if it were not for God’s grace toward me through the reading and applying of this book.” —David Platt. This is a classic that has stood the test of time. For forty-five years, seminary students and pastors have benefited from the principles found in this book. Two of Koller's popular texts, Expository Preaching without Notes and Sermons Preached without Notes, are combined in a single volume that allows preachers to prepare and deliver sermons without being tied to a manuscript or even outlines or notes. Among the eighteen topics discussed are the biblical conception of preaching, the advantages of preaching without notes, homiletical devices, the importance of structure, and the systematic filing of materials. Now repackaged for the next generation of preachers, with a foreword by current Northern Seminary preaching professor Michael J. Quicke, How to Preach without Notes is poised to continue its history of strong and steady sales.